TRR-FEC #32 - Breaking News - Alpha-Omega Amusements and Sales, Inc.
We are very fortunate to be in the position of testing so many of the new prototype test games and being first in line to get newly released games. 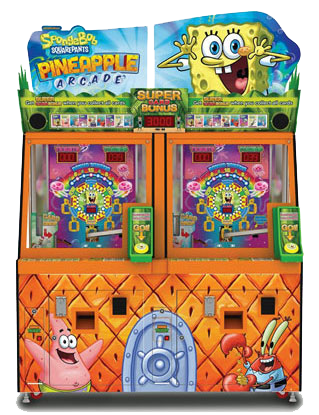 SpongeBob Pineapple (Andamiro) has been our most popular new game for the past 3 months and ranks in the Top 5 in every facility we have installed it. TRR covered this game in detail in the July-August Report. 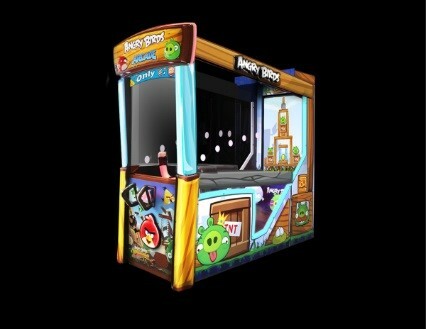 Our first Angry Birds Arcade (Play Mechanix/ICE) videmption game was installed 10-13-15 because all 77 Dave & Busters had the exclusive on this game over the summer through Labor Day. For the past 2 weeks it has ranked #11 and then #10 at our #1 Test Location. Through the use of an encased slingshot/plunger, the player launches a foam ball ‘into’ the back screen. Angry Birds has one of the biggest names in mobile gaming and their merchandising brand is still very strong. Just as we completed the ranking reports for TRR Sept-Oct, Quik Drop (Bay-Tek) was installed on 10-21 at $2/play. 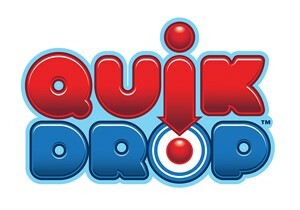 For its 1st week Quik Drop ranked #4. The object of the game is to use a single button to time the drop of each of 50 balls from a vertical shaft within a programmed amount of time (we set it at 22 seconds) into the five buckets that are located on the rotating playfield to hit the Jackpot. There is also an optional Max game time setting that kicks in to extend play if the player is not very skilled. We chose 3 additional seconds or 25 Max game time for this setting and were able to average a 30% ticket/e-credit payout. This concept of helping those players who are not having a good game play experience is nice to see make a comeback. I first experienced this type of feature back in the 1950s when playing pinball as a very young child. If a ball did not score anything as it rolled down the playfield between the flippers, that ball would not count and you got to shoot another pinball. That was most likely one of the prime reasons why I fell in love with pinball and got into this wonderful industry. These are the top 3 new games that everyone going to IAAPA should make sure to see and play. Other top earning games that TRR has recently covered: Fishbowl Frenzy, Crossy Road, Whac-N Win, Grand Piano Keys, and Magic Shot (replacing I-Cube) are all worth considering if you do not yet have them. Go to Test Games Report and Top 60 Games Sections for complete revenue and ranking details. The recently passed Nevada bill (SB9) allows casinos in that state to incorporate skill elements and other amusement game attributes into all types of gambling machines. In a nutshell it means that gaming machines can have variable-payback win percentages that are based on both chance and the player’s skill. The gaming industry is now pushing this type of legislation in each of the 40 states that offer some type of casino gaming. This law is a very important step forward for the casino industry, an industry that has not be able to affectively attract and retain the millennials (those born early 1980’s to early 2000’s) who grew up playing video games. This group and their young children is also very critical to the family entertainment center industry. Skill tournament games like Golden Tee and Big Buck Hunter also now may have serious competition from the gaming industry that is much better equipped to handle tournament and prize game experiences. The amusement industry is completely based on skill based play and any time chance can be quantified, there are always legal challenges to keep chance to a minimum. I say this because there is enough evidence to show that some small element of chance is involved in any physical action on Earth and 100% skill is not a reality (but 99% is possible). In addition Nevada and 4 other states have recently banned fantasy sports (60 million players) such as FanDuel and DraftKings and now requires them to obtain gaming licenses if they wish to reopen in Nevada. The growing consumer demand for transparency in the daily and weekly fantasy pools will lead to having the fantasy sports sites properly tested and certified. In fact GLI, the global leader in testing gaming machines and online gaming systems in 475 global jurisdictions, has already presented a white paper on fantasy sports listing the benefits of proper certification and the necessary steps required to have the websites analyzed. The white paper can be downloaded for free at www.gaminglabs.com. This means that the debate over whether fantasy sports is a game of skill or is gambling is really no longer so important. It certainly looks like fantasy sports will continue and be regulated by the gaming industry. The next step is for the gaming industry to look at is to establish a model for players to compete in daily and weekly pools but without the traditional sports fix and expand the player base to hundreds of millions. The recent Global Gaming Expo (G2E) event saw the gaming and casino industry fire direct attacks against the amusement and redemption sector. Along with the presentation of Space Invaders and Frogger (expected to attract baby boomers) in skill-gaming packages including bonus skill rounds, there is also development in this sector for games like Guitar Heroes that offers skill gaming features and compelling repeat play elements. The danger seems to be that that the entry of the gaming trade to skill based gaming could see the traditional amusement trade losing further market share. 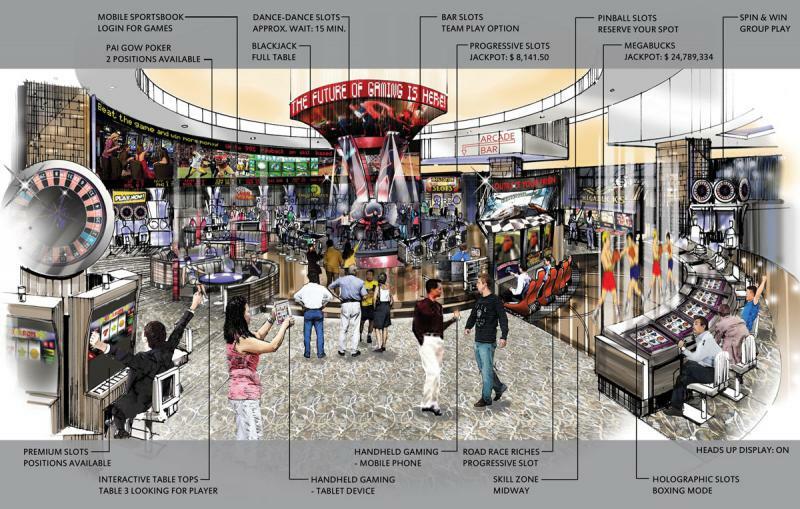 While the amusement trade battles the issues of Adult Arcades and looks for states to expand operator involved gaming (both are valid initiatives), the gaming industry is also looking for a way to control or regulate virtual sports tournaments and incorporate them into their core business. In just a few short months the gaming industry has made great progress in gaining back market share, all at the expense of the amusement and FEC industry. It was my original hope that our industry would benefit from working closely with and incorporating new skill-based ideas from the gaming industry to produce appealing redemption and merchandising games. That is still my hope. At least some amusement game manufacturers will obtain some great licensing deals.